Westminster City Council has defended itself against accusations it has ‘betrayed’ Londoners with its decision not to make Oxford Street a traffic-free area. Council leader Nickie Aiken yesterday said the city council had to ‘rethink’ its strategy towards the popular shopping destination after confirming pedestrianisation plans had been dropped. ‘Westminster City Council is hugely ambitious for Oxford Street and we will do everything we can to ensure the district’s long term success in the face of a challenging and ever changing economic and retail environment,’ she said. The mayor of London, Sadiq Khan, for whom pedestrianisation of Oxford Street was a flagship policy, criticised the council’s decision. ‘This will be seen as a betrayal of the millions of Londoners and visitors to our city who would have benefited from making Oxford Street a safer, healthier and better environment,’ he said. Mr Khan also said the timing of the decision ‘could not be worse’ because it was announced the day House of Fraser closed their shop on Oxford Street. A million people were contacted by Transport for London and Westminster City Council in a consultation between 6 November 2017 and 3 January 2018. Out of 14,377, over 9,000 either supported the project outright or backed plans with ‘some concerns about certain elements’. Cllr Aiken, however, insists that local residents do not support the plans to transform the street. 'As the local council, we need to make sure that everyone can benefit from improvements, not just certain groups. I utterly reject any suggestion that there is any kind of betrayal,’ she said. ‘Quite the contrary, we are sticking up for the people who know best, those who live and work in the district. 'But doing nothing to improve the area is not an option either if we are to maximise the potential benefits from the opening of the Elizabeth Line,' she continued. 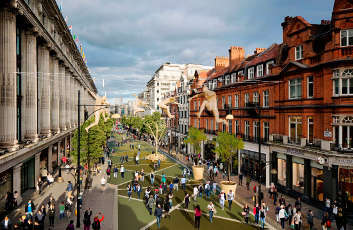 The chair of the London Assembly's transport committee said: 'We note Westminster Council’s decision to take the pedestrianisation of Oxford Street "off the table for good" and urge the Mayor to find a way to make it work, taking on board the concerns raised during the consultation process. 'This was one of the Mayor’s flagship commitments and he needs to think again about how to make it happen. Green Party London Assembly member Caroline Russell blamed the council's decision on a lack of leadership from Mr Khan. 'This is a devastating example of the Mayor’s lack of leadership in actually making our streets better for people. Nice plans are no good if he can’t put them into action,' she said.